The 2019 Oregon Potters Association Ceramic Showcase is this Friday through Sunday at the Oregon Convention Center in Portland. Hours are 10 am-7pm Friday, 10-6 Saturday and 10-4 Sunday. Admission is free, though donations for Clay Education will be accepted. I'm in space 20, just down the aisle from the entrance. I'll have my new sculpture in the gallery, and will demonstrate Brushmaking and Decorating on Sunday morning at 11 am. 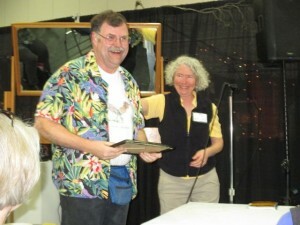 Also taking place at the Convention Center is The Gathering of the Guilds, featuring artists from the Creative Metal Arts Guild, Guild of Oregon Woodworkers, Oregon Glass Guild, Portland Bead Society and the Portland Handweavers Guild. It's a great weekend to get your art on. Took the day off yesterday to celebrate Easter with Denise, but today we had to face the fact that we're in countdown time for Ceramic Showcase. The van is well-stocked for a Saturday Market, but a three-day road show is another thing entirely. We need more of most everything, extra restock boxes of plates, soup bowls, tall mugs. Extra casseroles, baking dishes, servers, pie plates. A few things we only take to road shows, as there isn't room in our smaller Saturday Market display: tool crocks, covered canisters, yarn bowls. Weather looking to cooperate, we pulled all our boxes out of storage, backed the van out of the carport, and spent all morning and half the afternoon sorting, boxing, and making notes on various inventory sheets. As always, there's never enough room for everything we might need, so we make trade-offs. This pattern in one size baker, a different in the other. How many of each size of serving bowl are we likely to need? Is this enough pie plates? (No, it's never enough pie plates.) It's kind of fun, in an exhausting way, finding things we'd forgotten we stashed away back in the dark days of January and February. though to do it I had to take out my canopy and stuff boxes under the floor. Which meant I had to make a hook for snagging them back out again. It's always something. Tonight after supper we'll consolidate our notes onto two pages: a show inventory and a shed (i.e. back at home, sorry didn't bring it with us) listing. I've already started a looseleaf binder with parking pass, hotel info and the 19-page move-in packet. Tomorrow I'll load up the roof rack, bake cookies for the weekend, print out my road show checklist and start ticking things off. Wednesday afternoon, we drive to Portland and unload the van at the Convention Center, spend all day Thursday setting up. Our first road show of 2019. Wish us luck! It'll be a busy week. It seems everybody has a story like this. Robin and Richard once broke down at a show in Arizona. Bill's van stopped on the Golden Gate Bridge. It's a special feeling of helplessness, breaking down at an out-of-town show. 1. My first van, an over-worked Dodge Caravan, died during set-up at the Bend Summer Festival. One of our neighbors worked on his motorcycle, and was able to fiddle with the carburetor enough for me to drive it, choking and wheezing, off the street and into vendor parking, but it didn't run again that weekend. I had it towed to a garage to rebuild the carburetor, rented a U-Haul to get my pots and booth home. Later that week, I took the Greyhound back to Central Oregon to pay the shop and drive back down the mountain. 2. My second--current--van is a Chevy Astro cargo van, much better suited for a load of pottery than the Caravan, but it's not infallible. Driving back alone from a show in Coupeville--Denise had stayed home with a sick kitty--it broke down in 100° heat alongside I-5 just south of Albany. As with Bend, it had not been a good show--third year in a row of declining sales. The breakdown clinched it: we weren't going back there again. My roadside insurance only paid towing to the nearest town; I paid the extra to take it all the way back to my shop in Eugene, where they diagnosed a broken fuel pump, fixed by the next day. 3. The third time was just a week ago. We were in Washington again, at Edmonds. Because the show site is so constricted, they only let a few vehicles on the grounds at a time, coordinating volunteers with clipboards by walkie-talkie. They take some of the pressure off at load-in by dividing us up into time-blocks; north-facing booths like ours set up from noon to 2 pm. At take-down, though, everyone wants out at once. They confirm that your booth is packed before they give you at dash-board permit and let you get in queue. The queue runs forever. Two blocks up the hill to Alder on Eighth street, then down Alder for as many as four more. So you wait. Trusting your parking brakes. Start up, move forward a couple of car-lengths, shut down again. And repeat. On the fourth or fifth repeat, my van wouldn't start. No click, no grind. Also no lights, flashers, dome light. I phoned Denise to come up the hill to watch the van while I went down to fold up our tent and start hauling boxes of pottery out to the curb against the eventual appearance of the tow truck, thinking if we could load up fast enough, they might be persuaded to wait for us. On about the sixth load, my friend Shelly, from Club Mud, drove up to start packing her car, and asked how I was doing. I kinda lost it, told her the whole story. Upon receiving my tearful earful, she immediately drove over to my space, started loading shelves and hardware to ferry up to Denise, then came back to get pottery. Kim and Eddie, the paper-quilling artists in the booth behind me also pitched in, though couldn't haul as much, as they'd already loaded their work. Between the bunch of us, we managed to get everything out of the park and up to the van, where I was just finishing loading it in when the tow truck finally arrived. And refused to tow us. They'd send out a light duty hook truck, expecting an empty van. Fully loaded, we'd need a flatbed. ...And the dome light came on. I slammed the key in the ignition, twisted, and started right up. Thanked the operator, apologized to the driver, and headed for the motel, where we arrived just before midnight. And so to bed. The next morning, we packed up, loaded clothes and bears, checked out of the hotel. And couldn't start again. I'd noticed a battery store three-quarters of a mile down the street, so called to ask if they could deliver and install a new battery for us. Normally, they could, but a couple of people had called in sick (I'm thinking hangovers) so they were short-staffed. Which is how I wound up getting my morning exercise rolling a hand-truck down Broadway in Everett, getting a replacement battery, which I had to install with a pair of pliers and a crescent wrench. Barked my knuckles something fierce. And still couldn't get it to start. It turns out it's lots easier to get a tow on a Monday morning during business hours than it is late Sunday night. We rented our hotel room back for the day, and I rode with the tow driver to the nearest garage. They promised a check of the electrical system, said they'd do their best to get us back on the road again, and drove me back to the hotel. I get back to the hotel at quarter to six, noticing in passing that the shifter seems oddly stiff, and that the under-dash panel hasn't been properly reattached, but I'm so relieved to be moving that I don't think any more about it. We reload our stuff, check out again, and walk across the street for supper at the Chinese place while the horrible Seattle rush-hour traffic clears. We finally leave for home at 7 pm, catch clear traffic all the way down the interstate, and come in the doors here at just about 1 am. But I'm not done yet. While driving, we discover that not only is the shifter stiff, it won't go into low gear (1 and 2) at all. And when it gets dark enough to use the headlights, the instrument panel light doesn't come on until about ten minutes after we start up. So it's back to my shop in Eugene on Tuesday, where they eventually find, Thursday afternoon (short-handedness seems to be a theme here) that, in addition to not putting the dash panel together again, the shop in Everett didn't seat the battery properly back in its tray after replacing the terminals, just left it askew and tightened the clamp. This left a corner of the battery pushing against the shift column which... you get the idea. My shop only charged another hour, though it probably took them longer to retrace the previous crew's missteps. I took down a half-dozen coffee mugs as a thank-you present, then drove home to reload the van again for our show in Roseburg. I always envy jewelers at shows for the speed of their load-in and take-down. I forget that the have to do this every day. My product is neither so valuable nor so perishable that I can't leave it in the booth overnight. We take plates off of the vertical grids, but then just bring the walls down, fasten them, and we're done. Spent a bunch of time on chat-relay with Priceline Customer Service the last two days, trying to sort out my housing for the upcoming sale in Edmonds. Somehow, though I'd specified a non-smoking, accessible room at the hotel--the Days Inn by Wyndham in Aurora, a north Seattle neighborhood--the confirmation came back for a smoking room. Which my asthma will not tolerate. Hence the long sessions with Priceline. When we first started doing out-of-town shows, we were generally broke, and never sanguine about how our sales would be. So we couch-surfed a lot. Denise has a cousin in Seattle who let us sleep on her sofa-bed for years, and we had friends in Portland and Bend with spare rooms to share. Nearer sales, we'd commute, driving the hour to hour-and-a-half each way, each day to Roseburg, Corvallis, Salem, Silverton. Still do some of that; on long summer days, it's just easier to sleep at home in our own bed with our own cats. 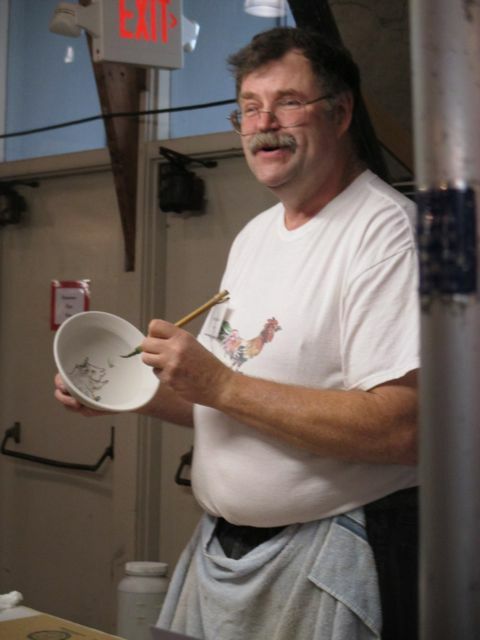 I started using Priceline at the advice of fellow potter Ken Standhardt, the first year I got into Clayfolk, in Medford. I was hoping he could hook me up with a local potter with a spare bed, but found out he just went online and bid for a place to stay. I tried it, found an affordable, not terribly shabby place at a reasonable proximity to the show, and have been using their service ever since. The last few years, though, the deals have been getting... less deal-y? Hotel prices are going up, and fewer of them are willing to discount by more than five or ten bucks. What with the 24-hour delay built into the bidding process, it started to be easier, certainly faster, to just pick a not-too-awful place and price and book direct. Particularly as we got more successful with our sales over the years. Well, look. When we go to an art fair, it's a business trip. We're in the booth long days, constantly on, interacting with customers. And neither of us is normally an extrovert. By the time we close the tent at 7 or 8 pm, we're wiped, no social graces left. We want to catch a supper, stumble home, and crash. We don't want to socialize. This is actually one of the reasons we stopped staying with people we knew. We felt like bad guests, bad friends. Going into a hotel room and hanging the "Do Not Disturb" sign on the door was so much easier. So our BnB host in Mt. Vernon was recently divorced, and it felt like he was trying to rebuild his social life through his guests, and his self-image by being the perfect host. He wanted to cook fancy, custom breakfasts, give tourist tips and advice, have long conversations after dinner. We just wanted dry cereal for breakfast, and room in the fridge for lunch meat and a carton of milk. He had a second guest to distract him for the first couple of days, but after she checked out, it was just us. I think we were a terrible disappointment to him. We tried again this spring in Portland, during Ceramic Showcase; I scored a basement room for four days for barely over $100. What a deal, right? It would have been perfect, had I been there solo. The place was a work-in-progress; they were funding renovations with their AirBnB proceeds. (The toilet broke down one evening, got pretty gross not being able to flush, but they had a replacement in the next day, had it installed shortly after we got back from the show.) Everybody in the house worked, so we hardly saw them. The basement was super-quiet, and nicely cool, though we had to turn off the plug-in air freshener. I'd rather do musty basement smell than heavy perfume. The big problem was the steps. Rough concrete, not very even or level, and no hand-rail. I'm not terribly athletic, but I'm tall and reasonably fit, so managed all right. Denise is shorter, five years older, and has a family history of rheumatoid and osteo- arthritis. Those stairs were murder for her. She could just about manage them twice a day, coming up in the morning, going down again at night, if I carried her book bag. Needing the bathroom in the wee hours was almost more than she could handle. So she decided that she was willing to pay extra, my next show, to stay in a hotel again. When I booked my room for Edmonds, they promised me a non-smoking, accessible room. It took a couple of tries for the Priceline Customer Service folks to get the truth out of them: that all their accessible rooms were already booked, and they didn't have any non-smoking rooms available for more than a day or two of our four-day stay. Priceline canceled the reservation for me, refunded the charge, and I went back online to look for another place, with six days to go. Found one, too. My choices were all either in Renton, in deep southeast Seattle, or Everett, about 20 miles north, so I chose Everett. (Never choose to drive south Seattle if you don't have to.) Paid a little extra, about 9 bucks a night, for a non-smoking room. And still saved nearly a hundred dollars over Lying Suites by Liars. To the 2018 Ceramic Showcase! We're in space 20, in the first row of booths as you enter, and I'll be doing one of my (in)famous "How to Use Roadkill in Your Art" (aka Brushmaking and Decorating) demonstrations on Friday at 2 pm. And in addition to the whimsical and functional painted pottery, we'll have the public premiere of Harriet and Mumfrey in the Showcase Gallery. It's great being back in the Convention Center alongside the other craft guilds. If you're in Portland this weekend, stop by and say hello! I've heard from two more shows, both acceptances, so I will be at the Umpqua Summer Arts Festival in Roseburg this June, and the Anacortes Arts Festival come August. The only shows I'm still waiting to hear from are Silverton Fine Arts Festival and Corvallis Fall Festival, and I believe their applications are still open. Edmonds says yes, Salem has me waitlisted. The latter is kind of annoying, since they were the show that emailed me twice last year because I hadn't applied (was busy with family reunions in Wisconsin in July). Ah well, there's still time. Up at Ceramic Showcase, in our new old location--back in the Oregon Convention Center, but sharing a hall with the other guilds. We're in the opposite end of Hall A than we used to be, a smaller, more compact show, but it's a nice layout, and easier, I think, to get around in than last years long narrow venue. I also like being back in the same building on the same date as the other craft guilds. More people come out for the combined event, and we spend free time cruising each other's shows, occasionally with intent to buy. I don't have a work shift until 1 pm, so spend the morning in the booth, talking to customers, restocking pots and discussing pottery with the high school students who come in by the busload. Explain my decorating process to one pair, who take copious notes and wonder between them which of their shop glazes would make the best base for over-glazing. When another girl tells me she's only managed bowls on the wheel so far, I tell her how to make a canteen-style bottle by joining two bowls together, tipping it vertical and adding a coiled foot and neck. And make her promise to email me a picture if she makes one. Baba Yaga Takes An Apprentice (I changed the title, after I glazed striped "witchy sox" in red and white on the little girl. Figured she's trying to make a good first impression.) gets a lot of favorable comments, both from customers and other potters, many of whom said they voted for me in the awards poll. So I guess I shouldn't be too surprised when the gallery host comes by mid-morning, says do I know that my piece is getting an award. They've moved it onto the front pedestals, and do I have anything else to put in the gallery? I don't have another sculpture, so give them a big oval platter. 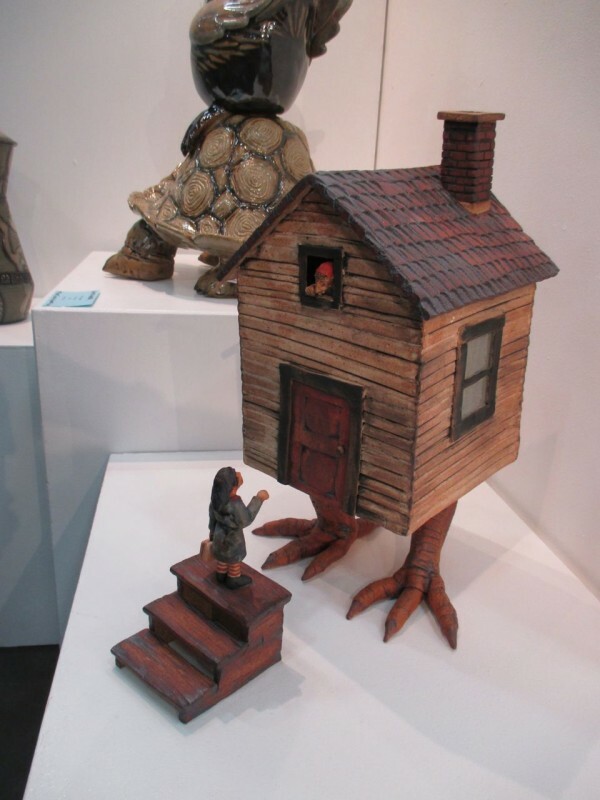 Later, when I walk by the gallery, I see that Ginger Steele has a teapot on the spot, and Terry Axness has a beautiful big sculpture, featuring a crab, a pelican and a giant tortoise. I figure Ginger for the Bennett Welsh (surface decoration) award. Since Terry's piece is on the highest pedestal, I figure me for second place, which is still pretty nice; highest I ever did before was Honorable Mention, two votes below the third place winner. Comes six o'clock, and Dawn announces that Ginger, indeed, has won the Bennett Welsh award. Then she announces second place to… Terry Axness! Guys, I won Best of Show. Serious bragging rights, and a $250 prize. Also? While I was on sales shift this afternoon, I met the people who bought the sculpture. Less than two weeks to go to Ceramic Showcase. After two years in the basement over at the Coliseum, we're moving back to the Oregon Convention Center, where we'll be next door to the Gathering of the Guilds: jewelers, metal smiths, glass and fiber artists, woodworkers. I'm hoping it helps. Striking out on our own, with a different date and different venue, certainly didn't. 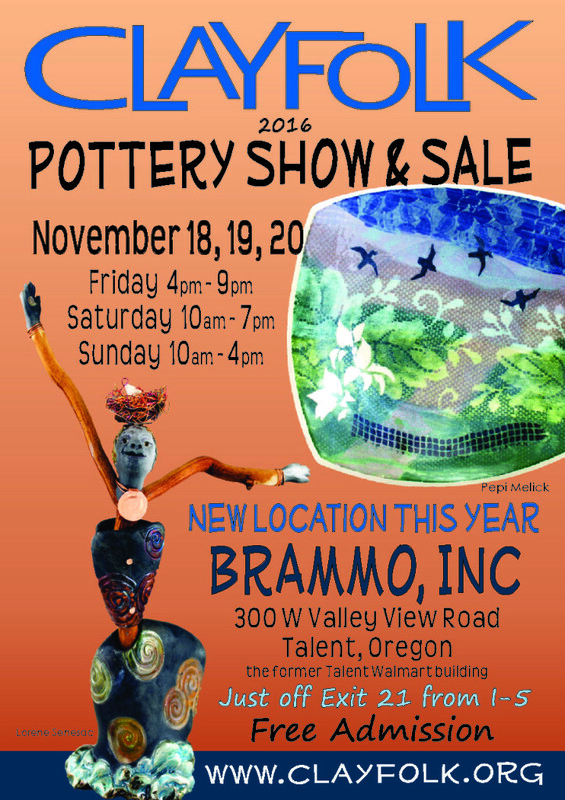 Ceramic Showcase will be Friday, April 21-Sunday, April 23 at the Oregon Convention Center. Hours are 10 am-7 pm Friday, 10-5 Saturday and 10-4 Sunday, and we're in space 20. I did brush drawings long before I made pots, india ink on paper, high-contrast still-lifes and figures. I loved the speed and fluidity of the process, so different than the interminable gradations of shade and value from pencil or charcoal, or the endless cross-hatching of pen. I started painting on pots in 1984, at Tuscarora Pottery School, using an iron oxide wash derived from a Michael Cardew recipe. I still have two of the first painted plates I ever made, one a grouping of California poppies, the other a landscape, featuring the Ruby Mountains and a tumbled-down dynamite shack. I did a lot more brush decorating in the year following, but quickly got bored with the brushes. I could only afford the cheapest sumi-e brushes back then, $5 being about my limit, and using them was like drawing with a Sharpie, or a technical pen (I was also cartooning with Rapido-graphs at the time). Each brush gave one thickness of line. If I wanted the line thinner or fatter, I'd have to change brushes. And remember what I'd dipped it in last, so as not to contaminate the rutile with cobalt, or the cobalt with iron. So I decided to experiment. I talked my sister out of a couple of squirrel tails from her hunting days, and made a couple of brushes. Tied off a bunch of hair with thread, cut it loose, and wedged it into the split end of a dowel, wrapped it with string and paraffin wax to hold it all together. They were the very definition of crude, but the long, flexible tips let me draw with a line that would vary from very thin to very broad in the same stroke, as the brush flexed, deformed, sprang back. I stopped painting in graduate school, concentrated on unglazed sculptures, but went back to it afterwards while teaching at the Craft Center. I'd picked up experience with new materials, primarily bamboo and two-part epoxy, and had inherited a bunch of tools from another pottery student that included some fine cake decorating tips. So my new brushes were a good deal more sophisticated than the originals. I still use the hair from the side of a squirrel tail (either recycled from roadkill or purchased at a fly-tying store), but I tap it down into a cake-decorating tip to graduate and taper the hairs, before tying off the bundle and setting it with epoxy in a bamboo handle. The resulting brushes are far from high-end sumi-grade, but they're kinda elegant, and moderately unpredictable, which is what I want from them, after all. Which brings me to this last Saturday morning, up on the Clay Fest demonstration stage. 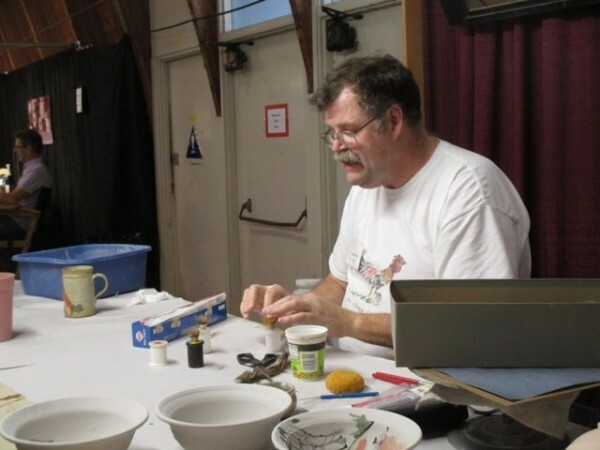 I've got a dozen bisqued Empty Bowls, my brush station, a basin of glaze. I've also got squirrel tails, thread, bamboo and epoxy. So I spend my two-hour demo alternately taking decoration requests from the kids (and adults) in the audience (parrot, heron, hedgehog) and making paintbrushes for the potters in the crowd. Around the 1:45 mark I glaze the last bowl and test the last brush, so have 15 minutes for clean-up before the next demo goes on. Up in Corvallis, home of the Oregon State University Fightin' Beavers, for Corvallis Fall Festival. 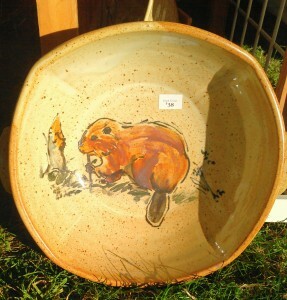 Unloading the kiln on Wednesday, I proudly showed off beaver patterned pottery to fellow Club member Jon King (who happens to live in Corvallis). Oh, now, that's just pandering, he said. If it doesn't sell, it's pandering, I reply. If it sells, it's marketing . ETA: So far, tall mug and dinner plate, marketing; cookie jar, pie plate, baker: still pandering. If I had any strategy coming in to Anacortes, it was sea life. 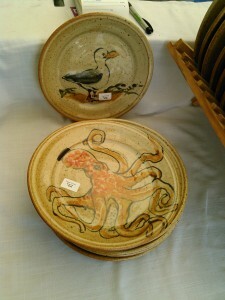 I'd stocked up on crab and octopus patterns, of course, but also puffins, sea otters, salmon. There was a sea gull, sanderlings, some eagles, even a dessert plate with dolphins. I say was; most of them are gone. The octopods went early, octo-people sweeping down on us Friday morning. Maybe four pieces left, and I still have hopes for the sugar bowl. Crabs went next, I'm down to two plates as of this morning. Puffins and seagull and otters have all made some sales. Other things too: bunnies, of course, chickens, dragonflies, moose and flamingos. Aside from the sea life, it's been a pretty balanced sale. Wind was an issue again Friday, but we worked around it. Took down the grid display for the afternoon, and all the walls. Saturday morning, we moved the right-hand units in about 9 inches, and put the grid up again. Now, even if the wind shakes the canopy, it doesn't move enough to threaten the pots. We also can't just close the walls overnight. We spend an extra half-hour at the end of the day boxing up pots from the top two shelves, then wrap the lower display with tarp. If it were to rain overnight, we'd have a mess, but as it's dry--but breezy--we're all right. Once we stop seeing our first-in-show location as a hazard, it turns out to be a benefit. Sales are well up from last year, and I can't help but think that it's because we're the first thing so many people see as they enter the show. 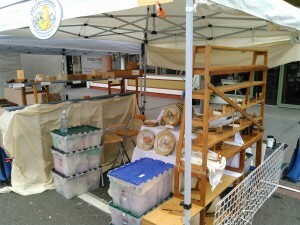 Back at Anacortes, and once again, at the front of the fair. Oh, they moved me 20 feet (two booth spaces) north on Commercial Avenue, but then they eliminated the first two booths. Once again, I'm the first artist you see when you come into the fair. 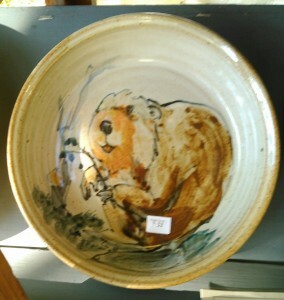 Look, I sell pottery. It's bulky, it's not light, it's fragile. It's not the sort of thing you want to buy coming in the gate, and then carry around all day. Honestly? It's the sort of thing you think, Oh, I'll stop back on the way to the car and then forget about in your exhaustion six hours later. So I have strategies. I hand out business cards, of course. They're a tangible reminder to folks where they stopped, and where they'd like to return. Sometimes I'll write my booth number on the card, for an added reminder, or a note of the pot or pattern they were interested in. Sometimes, they even come back. More successfully, I offer a free bag check. Anyone who buys pots from me on the way in is welcome to leave the bag with me and pick it up on the way out. All I ask is that they write their name--and phone number, I live in terror of the idea that someone will pay me money for a pot, forget to collect it, and I'll have no way to remind them--on the bag. It works, too! 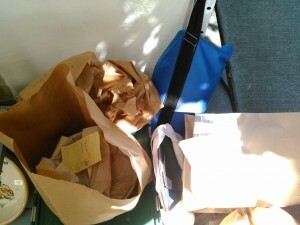 I had as many as seven bags waiting for pick-up at various times today. All in all, a very busy, successful day.